For the next few nights, bright Venus and Jupiter will be joined by other planets at dusk. Skywatchers have been watching with anticipation lately as Jupiter draws close to Venus in the evening twilight sky. This week, as Venus and Jupiter draw close for a March 15 conjunction, they are joined by the planet Mercury somewhat lower in the sky. Observers with binoculars may also be able to spot Uranus, just below Mercury, and dwarf planet Ceres nearby. Another dwarf planet, distant Eris, is also close, but too faint to be seen through amateur telescopes. 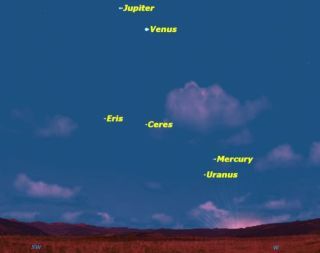 The sky map of Jupiter and Venus for this story shows how the planets and other solar system objects appear in the night sky. Jupiter and Venus are currently the brightest of the planets, but present some remarkable contrasts to anyone with a small telescope. Through a telescope, Jupiter appears almost twice as large as Venus, though that will change as Venus swings closer to Earth over the next few months. When Venus is closest to Earth on June 5, it will appear three times larger than it is at present. At that time, it will pass between Earth and the sun, appearing as a tiny black spot against the sun. This Venus transit occurs less than twice a century. The 2012 transit of Venus occurs on June 5 will not be repeated until the year 2117. The atmospheres of the two planets are also strikingly different. Jupiter shows a complex pattern of cloud belts and spots, while Venus has only a bland, smooth white cloud deck. However, Venus' clouds mask a complex planetary surface of mountains, valleys, and gorges, baking at a temperature of 860 degrees Fahrenheit (460 degrees Celsius). While the "traditional" planets, such as Jupiter and Venus, are among the brightest objects in the night sky, deeper investigation of the solar system in recent years has added many fainter objects. Because of their small size compared to the solar system's eight planets, these are called minor planets or dwarf planets. They fall into two groups based on their location: the asteroid belt, between the orbits of Mars and Jupiter, and the Kuiper belt, beyond the orbit of Neptune. Ceres is the largest object in the asteroid belt (592 miles or 952 km in diameter), and Eris is the largest in the Kuiper belt (1445 miles or 2326 km), a group that also includes former planet Pluto.